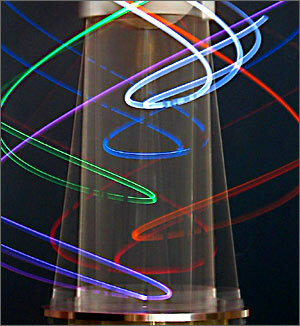 The basic idea of the Orbit machines is simple: a "ferris wheel" with LEDs on it rides upon a turntable. The following material deals with the realities of designing and building such machines from scratch. As of 2008, 3 Orbit machines of about 36" tall have been built, this discussion applies to all 3. For details of how the 3 are different, see the evolution page. The main subsections of an Orbit machine are indicated on the left side of the illustration, and each will be examined in detail below. These machines may not weigh much, but they do create significant dynamic loading (see dynamics page for more on this). The core structure must be fairly strong, precise and stiff to minimize the effects of vibration. The fundamental structural need is for a free rotating verticle hollow shaft containing some wires. I used the columns and decks approach. Each deck holds a ball bearing, and the 4 columns hold the decks together. This approach makes sense for DIYers because cylinders and plates are easy to work with and not far removed from raw materials. The coulmns are 1 1/4" diameter aluminum. They are lathed to equal 4" lengths and tapped for 3/8-16 screws. At the heart of this stack are a pair of ball bearings like the one pictured below. They are spaced 4" apart. 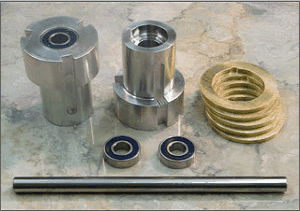 The shaft is held in place axially by collars, and prevented from contacting the outer race with shim washers. 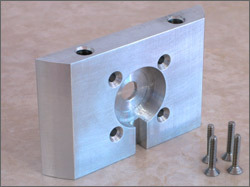 A boring head was used on a milling machine to create the accurate 2" diameter holes for the bearings. 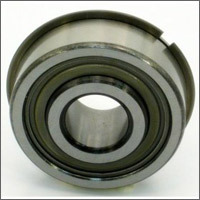 Snap rings prevent bearings from "falling through" the decks. Can those little balls in the bearing withstand vertical force like this? Ball bearings can be a complex subject, but for our purposes they don't need to be. These are "R16 deep groove ball bearings" which are rated 1500 pounds maximum radial load. (Radial load would be sideways force here) The rule of thumb is that maximum axial capacity (vertical here) for deep groove ball bearings is 25% of radial capacity. This gives 375 pounds, plenty of strength for this application. 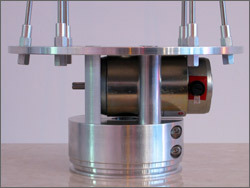 The turntable assembly connects the hexapod structure to the main axle. It also serves as a motor support, a belt pulley and a wiring junction. A substantial puck of aluminum (left) has been slit to become a "grip tube" (aka one-piece clamp). The extrados and belt groove are lathed while gripped on a centered arbor. This results in full concentricity - important for smooth belt operation. 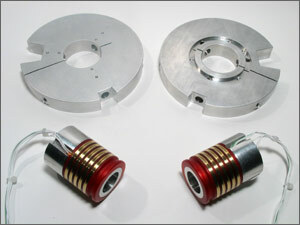 The motor mount plate (right, above) also serves as a platter support element. The actual turntable platter is lathed from 1/4" aluminum. It has a slot for the rotor drive belt and 6 holes for the hexapod which are angled and spot-faced on top and bottom. 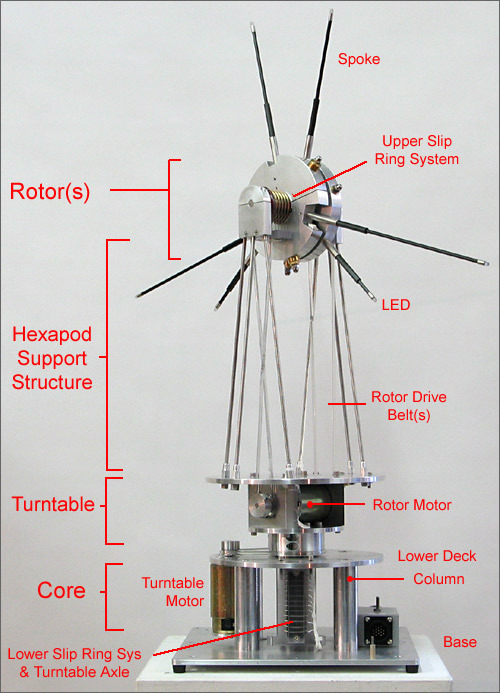 Orbit's rotors are held aloft by the hexapod support structure (more correctly called a pair of space trusses). The design required both rigidity and transparency, and a space truss approach satisfied both needs nicely, at the expense of some design / build complexity. Trusses, structures composed of triangles, are famously rigid. And the benefit of "transparency" (i.e. minimal material to do the job) can be seen at right: the light streaks are only slightly obscured. The support structure pretty much disappears in dim room light. The hexapod starts with 6 lengths of 3/16" diameter stainless steel rod. Both ends get threaded with a 10-32 die on a lathe. The mating surfaces are drilled and spot faced at the correct angles. 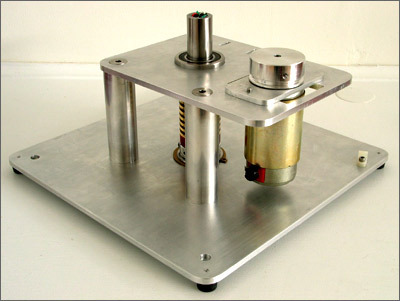 The rod top ends get tightly screwed into blocks; the bottom ends are held to the turntable platter by 2 nuts, and are thus height adjustable. Accurate assembly by adjust-and-try methods is quite difficult because there are 6 adjustments (at each rod's bottom). 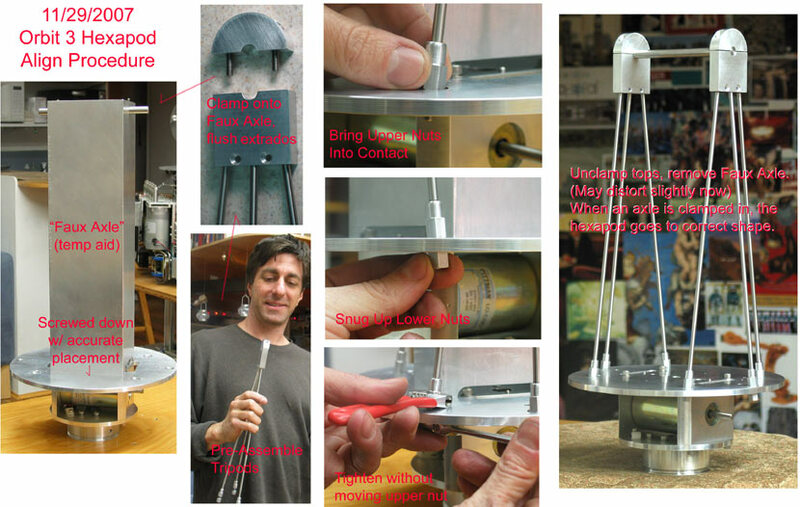 Eventually, the jig-like method shown below was developed, giving fast, accurate results. Once the 2 tripods are joined by clamping in the top axle, the resulting hexapod is very rigid. The rotor (2 rotors on Orbit 3) sits atop the machine and spins in 2 axes. Its job is to safely carry the spokes which carry the LEDs. 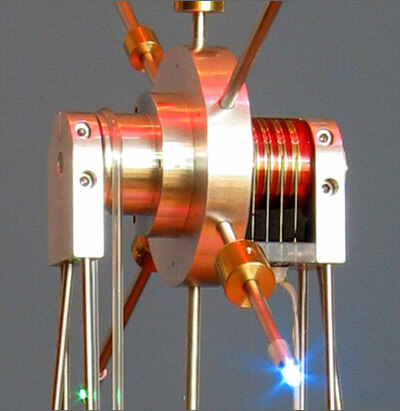 A rotor is tightly integrated with it's slip ring system, which carries electrical power for the LEDs across a continuous rotation axis. The basic structural layout involves a stationary 3/8" axle (locked to hexapod structure) upon which ride 1 or 2 ball bearing supported rotors. 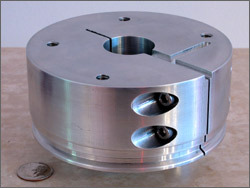 Each rotor is made in two pieces for fabrication practicality reasons. The spokes are subjected to severe oscillating loads. They must be strong and also well attached to the rotor - "redundant positive engagement" is employed: 2 cone point set screws penetrate holes in each spoke. The rotors also must securely house a bunch of wiring - going from the slip rings to the LEDs via the insides of the spokes. A series of slots and tunnels in the structures form wire paths. Once the wiring is installed, it is stablized with 5 minute epoxy dabs. The brass weights and cutaways are involved with static and dynamic balancing - explained in the dynamics page. 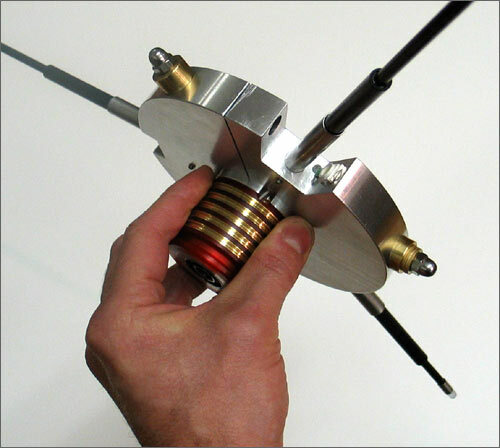 The rotors of Orbit 2 can spin at 25Hz (revs per second) aka 1500 RPM. This gives an LED speed of 116 mph. Mechanical power is transmitted from the motor pulleys to the rotating joints by 3/16" diameter clear urethane round belts. They are like O-Rings, but with properties ideal for belt usage (e.g. they don't "relax" over time). The belts ride on custom pulleys which may, as in the photo, be part of other structures. 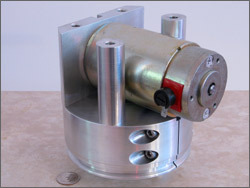 By controlling pulley sizes, "gear reductions" can be achieved: a reduction of about 2.5:1 occurs on the turntable and about 1.5:1 on the upper rotor. The turntable has a lower maximum RPM due to fighting more total wind drag. Despite initial concerns about the belts flopping around due to centrifugal force, it turns out not to be an issue. The urethane belts have been easy to design and build with, they look nice, and have been totally reliable.